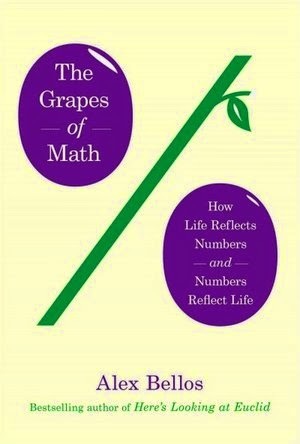 A blurb today on yet another fine new book for the math novice or enthusiast: "The Grapes of Math" by Alex Bellos (oddly, the title is the same as an earlier math book for youngsters by Greg Tang). I very much enjoyed Bellos' prior work, "Here's Looking At Euclid," (American title). Publicity for Bellos' latest offering, however, appeared to focus on what seemed some trivial/light matters, and so I had lower expectations for this particular volume. The first five chapters were a bit disjointed and indeed mundane in some parts, but better than I was expecting, with a nice extended treatment of Benford's/Zipf's Laws in chapter 2. (The timing of the book's U.S. release, coinciding with Jordan Ellenberg's new book, may also have caused it to suffer slightly by comparison)… BUT after that first half, the book takes off on a scintillating ride (starting with chapter 6, on the number e, onward). Even though the topics covered are fairly standard fare for a general audience presentation, Bellos is a particularly sharp/clear explicator. He goes into more detail and explanation than many writers do, yet without being heavy-handed or tedious, moving along neither too fast, nor too slow, with a nice mix of illuminating topics. My favorite chapter is chapter 7, covering negative numbers, i, Euler's identity, complex numbers, quaternions, octonions, and finishing up with iteration and the Mandelbrot Set. It's not that these are favorite topics of mine, but I love the way the chapter flows along, Bellos seamlessly moving from one kind of number to the next with good explanations. Following chapter 7, come excellent, thoughtful chapters touching on calculus, self-reference, proof, the Bourbaki group (which is still active), and ending with a long, great treatment of Conway's Game of Life. As I say, I think the last 5 chapters of this volume are particularly instructive and wonderful, but depending on your inclinations, you will certainly find parts to enjoy in the first 5 chapters as well. And at the book's conclusion come 35 pages of worthwhile glossary/appendices/notes. 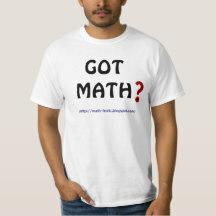 This will be a fine addition to anyone's general math bookshelf, or a great gift to a young mathematician-to-be. Player 1 writes down two different numbers on two slips of paper. They can be anything: 3, 22222222222, 14 billion, 1/17, .0375623524, whatever. Two different numbers I'll call x and y that are placed face down on a table. My goal as Player 2 is to try and pick the largest number of the two, by picking up one piece of paper, looking at it, and deciding whether I wish to stick with it as probably being the largest, or switch to the other (sight-unseen) slip of paper. If I select a piece of paper and it reads, "1,008,465,243,195" I must decide if I think the remaining face-down paper is a lower or higher number. And probabilistically I have no way of knowing, so my chance of guessing right is 50/50 (this assumes no Bayesian factors that might actually be involved by playing the game with the same person repeated times). BUT what Bellos informs us is that if you play the game repeatedly many times, then there is a strategy that assures that (probabilistically-speaking) you can win over 50% of the time (even if only slightly over 50%). The strategy is as follows: When Player 1 is committing his/her two numbers to slips of paper, you also choose a number in your head, call it "k" -- any number of your choosing, although it seems to me, selecting an integer at least larger than say 2, may be of some benefit. You simply remember the number; no need to write it down or say aloud what it is. 2) IF your number k is HIGHER than the number shown, then assume the remaining (facedown) slip has the higher number and pick it. "…consider the value of k with respect to the two numbers on the pieces of paper. There are three possibilities: (i) k is less than both of them, (ii) k is higher than both of them, or (iii) k is between them. "In the first scenario, whatever number I see, I stick with it. My chance of being right is 50/50. In the second scenario, whatever number I see, I choose the other one. My chance is again 50/50. The interesting situation is the third one, when I win 100 percent of the time. If I see the lower number, I switch, and if I see the higher number, I stick with it. When my random number serendipitously falls in the middle of the two numbers you wrote on the pieces of paper, I will always win!" Bellos goes into a little more detail about the problem, but the basic point is that given many repetitions of the game over time, the third scenario yields at least a slightly better than 50/50 winning outcome. Just one more interesting probability thought exercise. Bellos' entertaining book is another fine addition to the growing list of volumes that can be enjoyed by math fans of various levels. Indeed, it does my heart good to walk into my local Barnes and Noble and find TWO math books gracing the 'recent bestsellers' table (Ellenberg and Bellos)! This seems like a paradise age we live in for math appreciation, for such to be the case (not to mention all the wonderful internet math resources continually available). May it continue. To see it on a bookshelf Jordan Ellenberg's new volume looks like a slim, modest read… but, in fact, it's a dense, almost 450-page, surprisingly rich, entertaining, and jaunty math volume. And I'll cut to the chase to say that even though the year is only half over, I won't be surprised if this turns out to be my FAVORITE math book for all of 2014! It will certainly be in the top 2 or 3. You might infer from that, that it is a volume bent toward statistical, probabilistic, and 'big data' related topics. You'd be right. 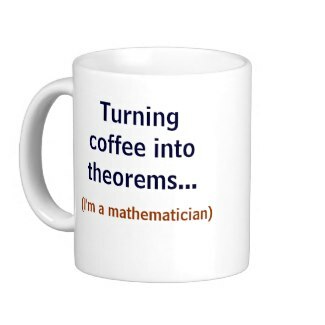 This is a math genre that has gained great currency in the last few years -- so much so that I'm a bit weary of reading popular (and somewhat redundant) treatments of these subjects. BUT... Ellenberg's text is amazingly fresh, current, and fun to read! So much so, that I initially wondered how much of the final product was Ellenberg's own voice, and how much possibly molded by an expert editor -- but Ellenberg has written a novel before and has a degree in creative writing… moreover, Cathy O'Neil (who wrote a great review of this book, and knows Ellenberg personally) assures us that the book "reads just like Jordan talks" -- so there you have it! Having said all that, I'll caution that the book, while written for a general audience, does require some minimal interest in, and aptitude, for mathematical discussion if it is to be appreciated/enjoyed. I'll reiterate what I've said before that the only math book I've seen in recent years that I think can truly draw in the naive math-phobic or math-inept is Steven Strogatz's 2012 "The Joy of X." For anyone though who has 'graduated' from Strogatz's treatment, this is a great follow-up, and concentrated on very timely topics, while yet covering a surprising amount of ground. Let me tell you just how fresh this book is: there is not one chapter, not one section, nor paragraph, or line or word about the Monty Hall problem! Don't get me wrong, I love the Monty Hall problem, and believe it is one of the most interesting, instructive math tales around, but it has become an obligatory, rite-of-passage entry into every popular math book around (especially any involving probability)… Ellenberg just skips it... and I think that's great! In fact, even when Ellenberg touches upon subjects that are fairly routine in such volumes, he gives them his own engaging spin, his own re-creation, that makes them fresh again. It is a remarkable achievement in exposition. Coming across topics like Monty Hall in other books gives me a sort of yawning 'oh, here we go again' gut reaction… I NEVER had that response reading Ellenberg. The very first example he uses in the book is a fascinating real-life one I was unfamiliar with, dealing with bullet holes in missing World War II planes: essentially, the question arose how to more efficiently aluminum-plate war-planes to resist being shot down -- too little plating and the planes were more vulnerable; too much and the added weight made them less fast and maneuverable. It was noted that returning planes had the most bullet holes in the fuselage and a smaller number in the engines… implying perhaps that the fuselage needed more protection… but NO, it took statistician Abraham Wald to deduce that the planes getting hit in the fuselage were actually able to return to base, and it was planes being hit in the engines that weren't even returning successfully (to be a part of the sample); i.e. it was the engine compartments that needed more shielding. The book is full of such clever, sometimes counter-intuitive examples. And throughout, a major theme of Ellenberg's is that mathematics is not so much computation and mechanical procedures as it is the careful application of common sense to pattern and structure. -- "the Baltimore stockbroker" -- this is a famous tale (though I've never seen it given this name before) explaining a system for sending out 10 newsletters successfully predicting some stock market movement, and then (with your 100% batting ave.) sending out an 11th letter soliciting new customers for your prescient services. And those are just some of the more interesting (popular) topics along the way, while in-between Ellenberg teaches a little calculus, statistics, Bayesian analysis, non-Euclidian geometry, game theory, and an excellent section on regression analysis (although this may also be, for many, the most boring or tedious part of the volume). Somehow Ellenberg manages to go into more depth than others often do, yet remain clear and not too technical. Also mixed in here, some reflective history as well, as Ellenberg relates how the "territoriality" of mathematics has expanded over time, from rather limited areas, to domains where it didn't even seem applicable at one time or another. And beyond the more usual mathematicians, there is mention of a sundry cast of characters: Daniel Ellsberg, Thomas Picketty, B.F. Skinner, David Foster Wallace, Antonin Scalia, all make appearances in these pages. Meanwhile, throughout, Ellenberg lobs in his droll humor along the way… rare (and wonderful) to find in a math book. For some reason the simple line that most cracked me up came when he was reporting on Bertrand Russell's famous communique to philosopher Gottlob Frege regarding the latter's magnum opus on math's logical foundations. Russell, almost casually, mentions a single paradox (now famously known as "Russell's Paradox") he has found in Frege's account of set theory , which essentially undid all Frege's hard work. Ellenberg writes, "Despite the respectful tone ('I have encountered a difficulty,' not 'Hi, I've just borked your life's work'), Frege understood at once what Russell's paradox meant for his version of set theory" -- something about even imagining the properly-British Lord Bertrand Russell writing, 'Hi, I've just borked your life's work,' sent me into a cascade of chuckles -- I'll just bet Ellenberg too formed a big Cheshire grin on his countenance when he wrote those words ;-) Anyway, there are many such grin-producing lines. Another lovely aspect of the book are the hand-drawn illustrations throughout done by Ellenberg himself. In a day of easily-done, precisely-composed graphs and mathematical illustrations, Ellenberg's hand-crafted jottings add another surprisingly delightful element of 'freshness' to these pages (I've seen books where hand-drawn illustrations didn't work well at all, but here they do!). This book (and its author) is getting widespread coverage right now (#19 on one bestseller list), and sometimes when that happens there's a lot of hype and PR involved… in this instance it's all well-deserved. Cathy O'Neil writes of Jordan having "an infectious positivity," and that is indeed one of the unexpected benefits and appeals of this volume. Just a splendid book (Fields Medalist Timothy Gowers says of it "destined to be a classic"), especially for the first time out-of-the-box… can't imagine what Jordan will do for an encore… or, if he even needs an encore after this bravura performance! 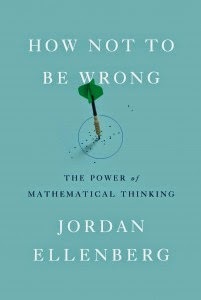 First, a note that Sunday morning, here, I'll have up my review of Jordan Ellenberg's new volume, "How Not To Be Wrong" -- hint: (like everyone else) I loved it. When I was much younger the first thing I read from Kurt Gödel was his "proof" of the existence of God. It seemed so weak and shallow I couldn't imagine there was any point in reading anything else generated by such a mind. So it was decades before I returned to Gödel to discover the delicious, insightful and logical profundity of which he was capable. In a similar vein, and not to take anything away from his other accomplishments, I never could see much significance in the "Turing test" of Alan Turing. As others have occasionally written, passing a Turing test probably says more about the gullibility, subjectivity, and naivete of humans (and the ambiguity/imprecision of language), than it does about actual artificial intelligence (AI); or put more simply, Turing tests likely say more about the human interrogators than about the machines being tested. I fully expect in the not-too-distant future a program will be written that can fool well over half of any judges interacting with it into believing they are communicating with a human being (and once one program does it, there will be a flood of others)… to which I'll yawn and quizzically mumble 'soooo?' I see it as akin to (while admitting it's different from) IBM's "Deep Blue" supercomputer beating chess grandmaster Gary Kasparov… interesting, noteworthy, even fun, but neither truly profound nor necessarily cognitively meaningful. One mathematician, critical of all the hype the story produced, tweeted: "isn’t it a wacky coincidence that the result came on the anniversary of Turing’s death? What were the CHANCES?!" And followed that with: "It’s almost as if the University of Reading is doing a Turing Test to see if journalists can tell the difference between ‘science’ and ‘PR’. I expect there will be more skeptical takes on the story in ensuing days, and will add links here as I see fit* (and I'm hoping certain bloggers will cover the story more fully and critically). Already, some are questioning the number of judges, the 5-minute conversations, the 30% benchmark, and other general circumstances of the test. The article ends on this simple note with which I'd concur: "It may be uncomfortable to live with uncertainty, but it’s far better than insisting, against all evidence, that we have accomplished a task that we have in fact scarcely begun."